Description of object /s : Looked like a boomerang. The "skin" was faint orange colored that glowed. It had lights in it. Sighting Event Details: We were out as a family watching the meteor shower. It was perfectly clear and dark. Then a big orange colored glowing crescent with 6 lights moved right past our eyes from East to West. It made no noise at all. It was very fast, and very smooth motion. All of us saw it. The kids and I drew seperate pictures that came out very similar. It appeared to be very big in size as we see commercial jets go along the mountains and this was a lot closer and bigger than they look. Commercial traffic to SLC always travels North and South, except we do get military helicopters once and awhile that come in back of the house. This object was way to fast, had steady non blinking lights that looked like they were part of the body, or skin made of light, and made no sound at all and was orange. My daughter describes it as a "flying crescent moon that is orange." Also, my husband was a former member of MUFON. He took my picture and compared it to a sketch on the cover of a MUFON magazine and they were almost identical. You may contact us by email for any further questions. Please do not use our names at this time in reporting this on the web, etc. You may do so without our names however. Thank you. # of Witness's: 4 total - 2 adults and two kids Seen in vehicle? Any Animal disturbance? : Dogs were heard barking, although that is somewhat common. After the sighting, 2 deer walked through the yard as well. So the dogs may have barked at them. Suffered Decription of effects: Just pure wonder at how clear this object was and how fast it went by. Seen before? Description of past experience: First experience like this. Description of object /s : We saw a large wing-shaped dark object. It was silent and flying close to the ground. It reminded me of bat wings or a kite. It seemed see through and yet we could see the edges of the object. Sighting Event Details: We were outside watching the meteor shower that was forcasted. My husband saw it first, but passed it off as a bat. Then I saw it. It seemed like it was see through and only the edges were visible because the moon was so bright and the sky so clear. We saw it again after that and then we were spooked so we came inside :). Last Seen Direction of Object: ? Sighting Event Details: I was outside and I saw a boomerang shaped aircraft that was outlined in a thin haze of gray slowly fly over my house heading southeast. It did not make any noise and did not have any lights. I saw it for about less than a minute until I lost sight of it. I have never seen anything like it and do not know of any aircraft that is shaped that way and doesn't make any noise or have any lights, particularly at night. Description of object /s : At first it appears to be a very big, bright star. It moves up and down, and side to side, in quick movements. When I started to video tape with a Sony 8mm, at first it looks like a bright star, and then it will get very big. Its hard to see that with the naked eye, but on the pull out screen of my video camera, you can see the detail. The best way to descripe it is, it looks like a petrie dish with germs moving all around. Then without touching my video camera it will go small again. This happened many times, through out the hour I was taping. It also appeared to have a firefly buzzing around the outside of the sphere. Sighting Event Details: We had just returned from working on a case in North Salt Lake. My sister was with me, she too is a PI. We stepped out on my deck to smoke a cigarette. Sherri said to me, "Is that the really bright star that Deon saw a few nights ago?" Deon is my little sister that lives two doors east of me. I went back into the house and retrieved my video camera and started to tape. Sherri went to retrieve my binoculars. I tried many times to just focus on the UFO, but it kept moving. I tried to keep the video camera stationary, but I couldn't. I do not know what this was, but I would love to find out. I had contacted Channel 2 News, and they have seen the tape. They were very interested in it. The guy asked me if I was willing to do an interview with them on TV. I told them, no, I can't. I don't want my face on TV, because of my business. I am not sure who they showed it to, but they refused to make ANY comment. Seen before? Description of past experience: About 19-20 years ago at the Redwood Drive In. I observed a strange blue green star moving up and down and back and forth. Once in the Southern sky and once in the North Western sky. Both times they shot off so fast I thought I was seeing things. My husband and children were with me. They were too involved with the movie to confirm what I had seen. Unfortunately, I don't remember if the sightings were both that summer or a year or two apart. Hear Sound? Yes Describe: Weird "jet like" sound, had a ringing or hum tone present that dropped in tone as it got further away, Heard sound before seeing craft. Description of object /s : IT was either square or a triangle, it had lights on the bottom of each of the corners, that were of a reddish yellow and purpleish blue hue to them. Sighting Event Details: It was around 12:30a.m. I was sitting out on the porch with my brother we were skywatching while I let the dogs out. We werent sitting outside more then 15 minutes when it appeared. It made no sound, it looked like it was square shaped with bright illuminating lights on each of the four corners of a reddish yellow and puplish blue hue. It was hovering in and out of the clounds for about twenty minutes then all of a sudden dissapeared behind a cloud. We sat outside waiting to see if it reappeared but to no avail it did not come out again. Description of object /s : It was a disk shaped object. on the outer perimeter of it a blue light radiated and on the inner part of it a light redish or orangish light. It went from a stand still and accelerated incredibly fast. it left a trail of light behind it. Sighting Event Details: Me and two other friends where standing outside getting ready to leave. I was having a cigarette before we left so we were talking. I looked up at the stars and I saw a disk shaped object in the air. as soon as I looked at it, it bolted off. I pointed at and said "whoa look look look" my friend looked up and saw it just before it disapeared. Suffered Decription of effects: All night afterwards I felt I was being watched. When i layed down to sleep a cat was attacked outside my window and I felt something was outside my window. I slept with the light on needless to say. Description of object /s : There were about three circular objects that were very bright and moving in ways that seemed like fireflys. They disappeared behind mountains to the north. Sighting Event Details: I was having intimate relations with my husband when from our van we noticed the three lights. At this time we noticed our radio had stopped working and we were all of a sudden picking up a station that seemed to be French. My quick-witted husband then translated some of the words. But we have no french radio stations here! We quickly retrieved what we could of our clothes and stepped outside for a better look. And believe me, it takes quite a bit to interrupt us! Estimated Size of Object: one object was bigger than the other two. Probably the size of an average house and the other two about 1 quarter that size. It was like a momma bear and two cubs. Seen before? Description of past experience: I have actually had many similar dreams of this and I can't believe it has actually occured. My husband thought I was crazy when I spoke of these dreams. Suffered Decription of effects: I have beaten myself up everyday trying to connect these dreams with reality. Description of object /s : I was driving south on 200 east just after noon and staight in front of me was a silver metallic disk oh maybe two-five miles south. I also noticed a fire near the area that I had seen it. I watched it for ten or 15 seconds and it just vanished. Forty five minutes later it noticed another one or the same one straight east just north of Gusher Ut. watched it for about a minute before it vanished. Also the night before I was lying on the front lawn and around 11:00pm a small triangular, black, jet flew over the house only about a 1000 ft. above. The odd thing about it was it was low and you barely could hear it. It certainly wasn't anything I've seen before. Also Around June 2003 Three extremely large very loud, black wings flew over just after night fall, Half of the town saw them, and know had ever seen anything like them. Height / Altitude of Object: 500-1500 ft.
Seen before? Description of past experience: When I was a small child near Arco Idaho My father said look out the back window It was late at night and the object followed us down the road for a ways and disapeared. Occurred : 8/21/04 Time of Sighting: From 5:00 A.M. to roughly 6:00 A.M. Location of sighting: Layton, Utah -- Actual "craft" silhouetted against the Wasatch Mountains. Description of object /s : Main UFO appeared to be typical "saucer" shape, though being so early in the morning as it was, it's impossible to know for sure. It seemed to be very large. In the darkness, only a line of bright green lights could be seen, appearing to me as though it were that of a "saucer" shape from the profile view. This row of lights would gradually intensify in brightness and then diminish, but not necessarily blink: this change of clarity could be attributed to the slight haze around the mountains at that time. Movement of this UFO was very sluggish. Around this UFO were much smaller UFO’s, perhaps four, all appearing as singular but bright green dots, which would dart around the larger one at a much quicker pace. In the way they were moving, it looked to me as if they were looking for something, or perhaps collecting something. They would pause here and there for minutes at a time, then dart off somewhere else. Over the course of an hour, these UFO’s (with the larger “saucer” type in the center and the smaller ones surrounding it) rose higher up the mountain, ‘til finally no more movement could be seen: there is a gorge, or overlap in the mountain where I last saw them, so I presume they went in there. Sighting Event Details: I saw all this from the kitchen window, with the naked eye and through binoculars. There was a slight haze, as is common in early morning. The UFO's, when I first saw them, were half-way up the mountainside, but as the hour progressed, they rose gradually. The larger one seemed to be the center of things, while the smaller ones darted around the entire mountainside. There were houses below the UFO's, at the very base of the mountain, but at the height the UFO's were at, there are no roads, towers, homes, or anything else that I am aware of that could have created those lights. On a mountaintop to the north of that area, there is a tower of some sort, though it is quite some distance away. In the east, there is also a building that I believe is a radio or observation sort of place, though I am uncertain; that is also some distance away. I don't know what these UFO's would be doing there, perhaps searching for something or collecting something or otherwise. From what I saw, they were not interrupted by any human activities, nor did they seem to be directly affecting the houses below them. The only sort of interruption that took place throughout the entire sighting was the sun rising: the UFO's disappeared from my line of vision just shortly before it would have been light enough to see them in great detail. Height / Altitude of Object: Not entirely sure...seemed to be directly in-line with the mountains, and I am unaware of their height. These are the Wasatch mountains that can be seen from Layton, next to Ogden canyon. Distance of Object from your Position: 2 to 2 1/2 miles. Last Seen Direction of Object: Northeast, as far as I could tell. Any Animal disturbance? : No, not that I am aware of. I'd gone into the kitchen prior to the sighting to find one of my cats, but I doubt that has any connection. Suffered Decription of effects: Other than the expected confusion and fear, no. Seen before? Description of past experience: No, not of this sort, though I have seen those faint "star-like" things that move erratically very high in the sky, but are most often attributed to satellites. Orginization Reported to: Alien-UFOs.com. I reported it in the forum provided for such things. Additional Information: Update: 8/31/04 - I'm beginning to realize that I am not very good at size-distance relations. I had originally stated that the larger of the UFOs I'd witnessed, the one that appeared to be a disk-shape, was roughly the size of Wal-Mart. Now, I've been recalling that hour in which I witnessed this and thinking about all of it, and I now know that while the object was big, it wasn't that big. Therefore, I think a more accurate size description would be about a little less than twice the size of a two-story home. I don't know if that means anything, but I figured I'd include it in this E-mail. Occurred : 8/14/04 Time of Sighting:11:30 P.M. Description of object /s : Object to dark to see. Same dimensions as Arizona sighting. 7 Amber Lights forming the shape of a huge triangle estimated to be from 1 to 2 miles across. 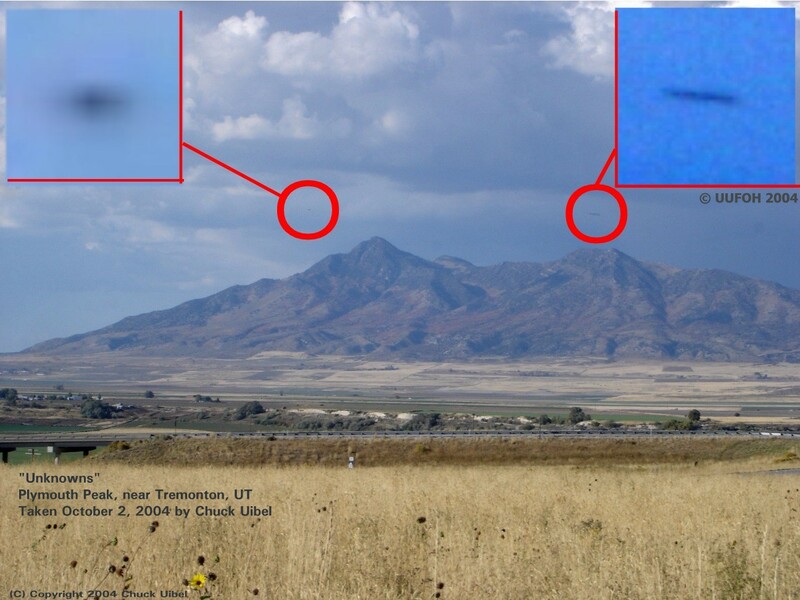 Object was stationary above the Drum Mountains for approximately 20 minutes, then lights moved to the North West and faded in order starting from 1 and ending with 7. Seen before? Description of past experience: Looked to be the same as the Phoneix Arizona sighting. Occurred : 9/11/04 Time of Sighting: between 8 and 8:30 p.m. Description of object /s : Bright, oval shaped object, probably 5-10 times brighter than any stars at the time. Sighting Event Details: I had been hunting deer in the upper Chalk Creek area. I just got back to camp, the sun had set, and it was getting dark. After being in camp for 15 minutes or so, I looked to the south just over the mountain tops and saw a bright light that was heading northward across the sky at a steady pace. The light was much brighter than any of the stars that were out. As it approached, my initial thought was that it was a satellite. I observed the object with my binoculars and could tell there were actually no lights on the object, but that it was high enough in the sky for the sun to be reflecting off of it. It appeared to be oval shaped. With the binoculars I could tell it wasn't an airplane or jet. As I oberved it through the binoculars I still was thinking it must be a satellite until I noticed that it was changing directions and it started gradually turning due east. As it traveled further east, it moved away from the sun's light and disappeared into the darkness. I wasn't going to report anything, but I checked this website and noticed another report from the same date. Distance of Object from your Position: 3 miles?? Seen before? Description of past experience: 25 years ago while nighttime snowmobiling. Saw several bright yellow lights moving eratically over the tops of the mountains near Lost Creek Reservoir. Description of object /s : I saw a blue light, at first I thought it was a star but I knew it wasn't because it was about 5 times the size of a star and had a white halo all the way around it. It was slowly moving downward in the sky. Very Slow. It then dimmed smaller and smaller like it was moving further away and then dissapeared. I saw it for a total of probably 45 seconds. I was wondering if anyone else saw this. Description of object /s : At least three or four disks conisting of multicolored lights. They zigzagged in sharp patterns across the sky at an extremely high altitude. Sighting Event Details: I was canoeing at night with several friends and I was enjoying the clear night sky. Thousands of stars were visible. All of a sudden, I saw several cicrles made up of colored lights start moving across the sky at high speeds in zig zagging patterns. It only lasted 10-20 seconds, but it happened twice that night. Location of sighting: while in the vicinity of 5th W and 45th S..looking west, there was a shard of light in the western sky over the Oquirrh Mtns. Details: Remained stationary for 15 minutes and slowly dropped below the mtns. Occurred : On September 23,24,26,27 there were many sightings in the sky above and behind my house they sightings started around 9:00 and continually observed all night. I have had many a witness to these strange crafts that hover and fly off to reappear a few hours or sooner later. on the 23, there were three crafts that were flying together that were of all different colors that were changing continually from a purple, red, blue, white and green they would fly side to side and up and down then jet off as it got daylight I phoned the police on this occasion. Then on the 24 we observed simaliar aircraft will the exception of one that was bright as the morning star that they surrounded it. Then on the 26 we observed a aircraft that was disc shaped and orange in color with white lights surrounding it in the middle, the craft hovered as the lights in the middle seem to circle around, On the 27the same craft from the night before was out again in the same spot as the night before it was observed for approximately two hours before it jetted off in the sky. I had taken pictures with a normal camera it was a canon advantage but I was wanting to know what type of camera would be best to take pictures with so that I can take clear pictures with a high resolution. I was always skeptical but since the first sighting in June I have been continually watching the skys. I would greatly appreciate hearing from you. Description of object /s : Guessing chrome-like, sun was hitting perfectly an it was reflecting like a mirror. Cigar shaped, standing on-end. Very large. Sighting Event Details: My husband pointed it out, it was very bright from the sun. We are both pilots and knew right away that it was NOT an airplane even though airplanes very often fly through that area during their approach to the airport. Using the airplanes that flew in the area in the minutes following, we estimated that it was at least 2 1/2 times the length of a 737. It moved slow, appearing to fly straight up and slightly to the North. We watched until it went behind a small patch of dark clouds and it never emerged from the other side. Height / Altitude of Object: No idea. Distance of Object from your Position: Only a guess, 30mi minimum. Estimated Size of Object: Twice the length of a 737. Last Seen Direction of Object: Directly West of Draper heading straight up and very slightly to the North. Seen before? Description of past experience: This is my fourth UFO sighting in my life. UUFOH Note: Left contact information - Fox 13 thinks its possibly a bug. UUFOH Note: Left contact information, Witness has photos but did not send with report. UUFOH will follow up. Description of object /s : it was pitch black triangle shape and it had colored lights at the three ends of the ufo's and it was moving silentlly there was no sound to the ufo's this happend when i was chasing my dog becuase he ran away from the trailor park that my wife and i now live in . Sighting Event Details: it was this last sunday night at 12 midnight and i was going to bring my dog in for the night and he got away and i hade to chase him all the way across town to were my mom lived at before she moved to willington utah and i had a sence of something was moving over me so i happened to look straight up and thats when i seen 2 triangle shaped ufo's hovering over me so i took off running becuase i didnt want to end up like travis walton in the movie fire in the sky i was underneath the ufo's and it was close up to were i could see the beings in the windows i have scetched a description of the ufos and the beings that i seen in the ufos and they started to move 2 seprate ways the one was movieng towards wood hill and the other towards the moab area . Available videotape or photographic evidence? : ???? Description of object /s : Upon leaving for work last night at 8:30, a friend pointed out a dark round object in the sky. The object was stationary 80 degrees upward NWW under cloud cover (under 2400 feet AGL). My calculations suggest the object was stationary 1/2 a mile away right over I-15 and University Parkway. It was visible in the light rain we were having and stayed in place for as long as I watched it, however did not show any signs of lights. It was still there when I left for work. Sighting Event Details: 80 degrees upward NWW under cloud cover. Nothing much happened. Description of object /s : There was two objects, they were flying side by side of each other. They were Diamond shaped, black in color and had six lights on the bottom of them. Sighting Event Details: We were headed south on I-15 when my daughter spotted the objects from behind us in the air. Both of the objects were just flying they flew over us and remained in sight we watched them turn east they picked up speed when they turned and flew off. I was wondering if anyone else had reported any sightings of such objects that night. It was just getting dark and the objects were very distinct. Description of object /s : This tri-angle craft was amazingly composed of innumerable lights! It was black on the outside, yet it was transparent. Within this 50 ft. long black, transparent craft were various colored lights of white,yellow,red and blue. The outer shell of the craft had a camouflage setup of lights, creating an illlusion of a typical starry segment of our nighttime Utah sky! Very ingenious! Sighting Event Details: I see U.F.O. 's almost everyday mostly at night, however, this sighting was closer than any yet. I looked out my living room window and saw it hovering 50ft. above my apt.! It stayed there for the next 3hrs. I stared at it for about an hour studying its other-worldly appearance and beauty. I could see the craft emitting a smokelike substance towards me and I could feel its mind-controlling effects! Not wanting to go with the craft I resisted its obvious abduction efforts and stopped staring at it! I walked away feeling my mind or my spirit in a peculiar state of un-natural elevation, as if I had been in a gradual state of abduction. Height / Altitude of Object: 50ft. Distance of Object from your Position: 50ft. Estimated Size of Object: each side of the tri-angle was 50ft. Suffered Decription of effects: I felt my mind enter a trance-like state, and could feel myself being lifted or drawn up towards the hovering craft. l 3 U.F.O. 'S MOVE THE MOON? Occurred : 11/03/04 Details 6:30 a.m. Description of object /s : Three huge, hockey puck shaped, brightly lit were seen moving close together, working together to move another object. Sighting Event Details: As unbelievable as the following may sound, it all happened, this sighting shocked me utterly, but I feel the public needs to hear it! 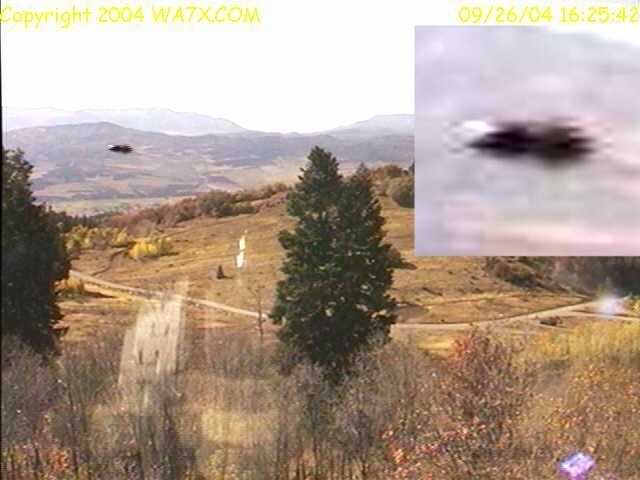 Looking out the living room window of my Springville, Utah apartment, I watched some U.F.O. 's rising upward, they looked very much like stars but were far too low. That was when I saw it! Three huge, brightly lit U.F.O. 's were around close to the Moon! I watched in absolute amazement as these hockey puck shaped craft, began to manipulate and MOVE the MOON! The stars which were below the moon, the ones I had been wathing rise, also moved in the same direction and speed . When the U.F.O. 's moved the moon North, the stars below it(the moon appeared to have been attached to a circular formation of 12 "stars") went down, pushed South, the stars rose up. For one hour I watched this bizarre sighting continue, until at last the U.F.O. 's disappeared. Exactly what was going on I do not know, but I do know that it was strange and it happened just as I have reported! Was this an isolated event? Or, are things really not as we have believed (or have been told to believe) them to be? On three other recent occasions, I have seen the Moon, flanked by two U.F.O. 's forming a tri-angular formation, cruising slowly NORTHBOUND! This is NOT The MOONS natural "ORBIT"! Is there an ALIEN base on the Moon? Is it possible that the Moon is in what APPEARS to be an "ORBIT" because it is always accompanied by these Alien escorts? I SAW THREE,HUGE, BRIGHTLY LIT U.F.O. 'S MOVE THE MOON ONTHE MORNING OF NOVEMBER 3RD, 20004!!! Phenomenon visible for how long? One hour. Height / Altitude of Object: The same altitude as the Moon. Last Seen Direction of Object: all directions, mainly southbound. Estimated Size of Object: all sixes -??? Description of object /s : As it moved across the sky it looked like a bell shape, but when it stopped I put binoculars on it and it was a huge ball. I have 20x60 optics so I got a real good look. It had lights on all the edges of the sphere. It blended in perfectly with the color of the night sky. Sighting Event Details: It was at twilight in the morning. There was just a little light in the East. The West was completely dark and I could still see stars. I was getting ready to go hunting. I think I was putting on a my sweater, when I noticed in the East sky there was a black object moving slowly to the West. I thought it could just be my eyes, but when I looked again I thought it was a stealth jet because it was just a huge black bell shaped object. I didn't hear any noise though, so I grabbed my binoculars out of curosity. The object stopped and I saw a huge black ball distinctly in the sky and there were lights flashing on the edges in all different colors. I called my brother and his wife to come out of the house and look and to bring the camera. By the time they got out it was in the darkness of the Western sky, but it was still there. I saw where it had stopped and they couldn't see it because with the naked eye it looked just like part of stars in the night sky. While I tried to explain to them where it had gone, I watched a black blob in the sky move quickly up and out of sight. I have seen weird lights in the sky before but I could always chalked it up to government testing. This was no man made object. Height / Altitude of Object: 1500 ft.
Seen before? Description of past experience: On the same mountain range I've seen stars move, but nothing like this. Description of object /s : round, sleek, and shiny. It seemed to camofloged with the sky, but then the sun hit it and you could see it a mile away. Sighting Event Details: I was with my friend, and we had just gotten out of the lake and were drying off. We looked up to see ducks flying in their "v shaped" position. Then, the sun came out from behind a cloud and we saw it. The saucer hovered in its place for about 5 min. Then it zoomed down toward the lake, skimmed the top of the water, and the went strait up into the sky. It drenched us after we were all dried off too. Phenomenon visible for how long? 5 min. Any Animal disturbance? : my friends dog, a big german shepard who i've never seen afraid, layed down and put his head between his paws and started wimpering. Occurred : 11/24/04 Details 4:30a.m. Description of object /s : Looking up at the sky on this early morning, I saw through my field glasses about 400 bright lights slowly descending to the ground. It took 40 minutes for them to make it down to the housetops, where they were seen to hover in close clusters. As these made thier way down it was plain to perceive that a dimming procedure automatically brought the crafts bright lights gradually down until they became comparable to a small candle. 15 of these craft did come to hover, 15ft. above my apartment for 4hrs. The illusion was subtle, however, my observations through persistance, have improved my vision. Now ,for me the game is over! Passing themselves off as stars, they have, for how long I don't know, have gone undetected! By dimming the central light under thier craft they can, and do, hover above our houses, and still appear to be a star high up in The Milky Way! Sighting Event Details: It was a dark night, it was a mass sighting. Phenomenon visible for how long? 4hrs. Height / Altitude of Object: 40ft. Distance of Object from your Position: 15ft. Description of object /s : Watching overhead stars and moving spotlights from theatre. Wing like object black appears high enough to block spotlight in unexpected way, yet moves very fast across sky. white lights appeared on back of wing as spotlight crossed it. Baffled that such a large and fast plane? could not be heard at all. Suspected/concluded that silent B2 bomber headed north to Hill air force base. Sighting Event Details: sitting drinking some beer in backyard late at night watching stars on clear night. There was a spotlight moving around the sky from a nearby theatre. there was a low steady background noise from cars on major street 4 blocks away. But background noise didn't drown out normal neighborhood noises like passing cars and crickets. Looking up at sky my friend and I both noticed an object moving north in the sky very rapid and completely silent. We both noticed that the length of the rear of the object lit up in several white lights when the spotlight happened to make contact with it. Like a row of christmas lights almost. Determined height from size and passing through spotlight as perhaps just over 1000 feet. Possibly less. May be estimating object as very low due to speed with which it crossed sky. Didn't have long observation time due to house roof next to us and warehouse roof about 100 feet from us blocking view. Both of us being college educated, yet not sophistocated in aerodynamics were very surprised at the behavior of the object. It didn't fit our expectations of a large flying object crossing the sky. If a jet had flown that low over us we had expected to be nearly rumbled out of our chairs. Or at least hear something. Height / Altitude of Object: wow! hard to say. 1500 feet best guess. Distance of Object from your Position: possible .5 mile west or less.